The bustling city is host to many overly expensive and incredibly tiny Japanese maki fares. Many a times you find yourself devoid of choices, having no other options but to order and pick out the one hate ingredient that could have ruined everything. 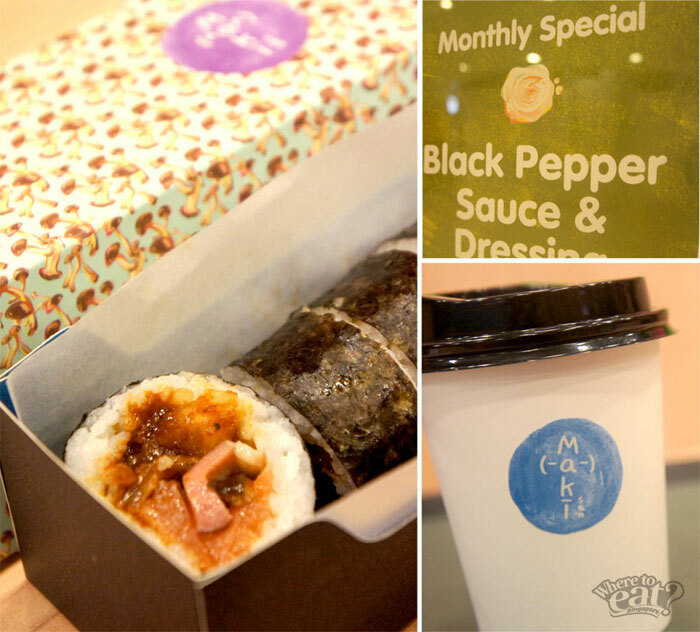 That is why we reckon you pay a visit to newly opened Maki-San at The Cathay Basement. No longer do you need to forcibly eat boring and inconsistent quality maki. Maki-San lets you choose what goes into your fresh made-to-order maki roll. Like Subway Sandwich counters, you get a clear view of how your maki gets cleanly and systematically prepared by professional staffs. 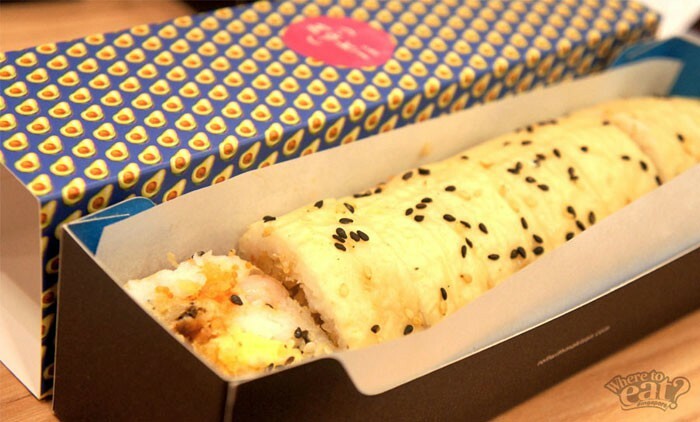 An almost completed maki roll will then be placed in a slicing machine to cut, before being packed into a creatively designed box to serve. 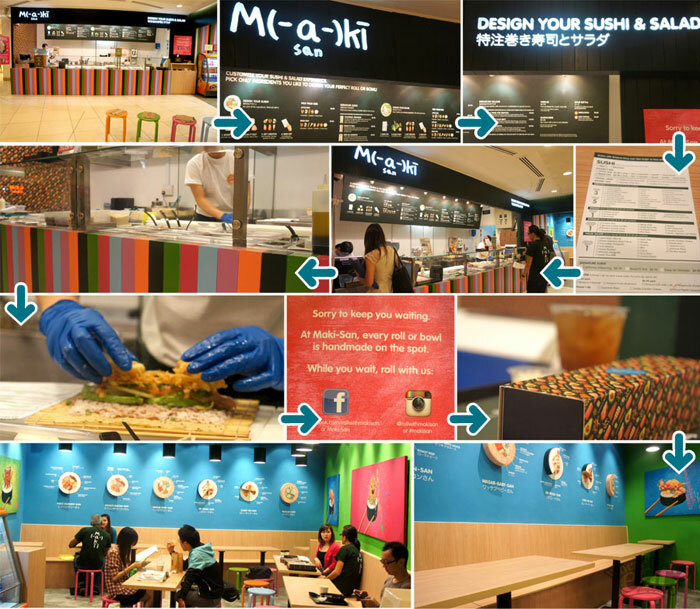 Fresh, fulfilling and highly customizable, you may never consider taking away maki from elsewhere again. We started off the afternoon’s session with their Lunar New Year Special, a twisted rendition of the tradition Yu Sheng called the Lucki-San Salad ($12.80). The unique dish plates fresh colourful ingredients, of which include the usual greens, cubed apples and pineapples, mandarin orange wedges, and sliced salmon sashimi. Served together on the side were fragrant chicken bak kwa, cashew nuts and crispy tempura. We completely drenched the salad in their tangy homemade mango-orange dressing, and was pleased with the bright palate. Lucki-San is refreshing and highly nutritious, and will be good to share among two to three people. Then, we tried to be a little too enthusiastic on the choice of ingredients for Little San ($6.90) and Mega San ($9.90). Apart from a choice of sprinkle and sauce, Little San lets you add 3 essentials, while Mega San lets you add 5 essentials and 1 special. 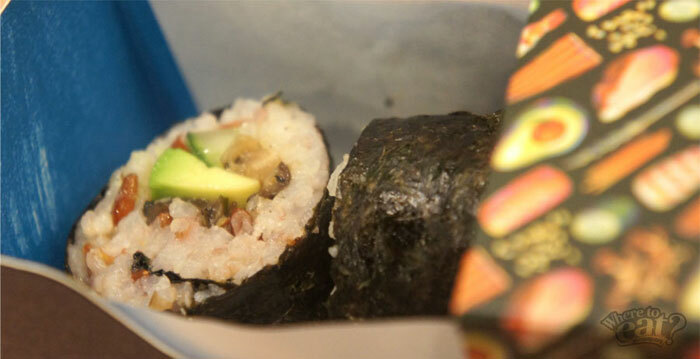 We also had to choose the type of wrap and rice we would prefer – there were healthy options available such as Healthy Soy with Sesame (+$1) Wrap and Healthy Brown Rice. I will not go too much into detail on the taste of Little and Mega San, as it will vary according to the type of ingredients one picks. Instead, it will be good to note that the portion is huge for the price you are paying. 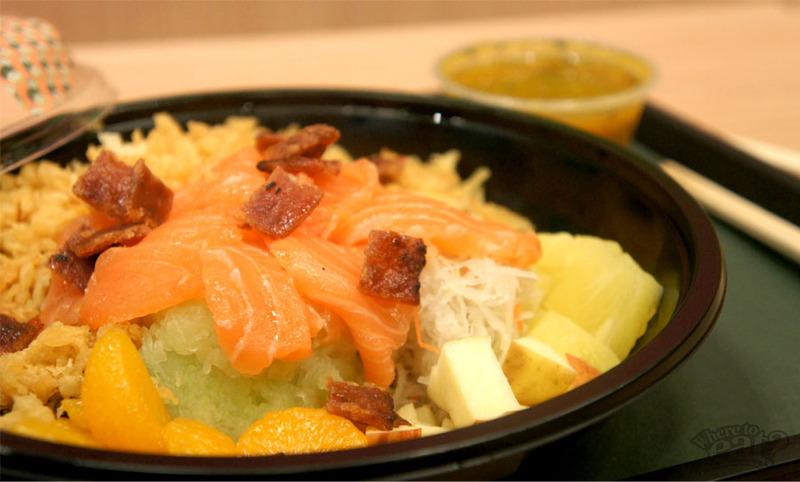 Nevertheless, if you are not as adventurous and want something that will not go wrong, you can choose from their selection of three Signatures that include California Dreaming ($8.90), Roast N’ Roll ($8.90) and Keep On Shrimpin’ ($9.90). You can also choose from their wall murals – yes, you read right – that used to be for decoration purpose only. Until recently did they decide to introduce them into their menu due to popular demand. We had the Miso-Hungry San ($16.90), which comprises of 6 special ingredients finished with barbecue sauce, and were amazed at how the different meat and vegetable textures blended so well. For those who prefer maki with a little spice, try the Curry-Ok San ($9.40), which comprises of teriyaki chicken in Japanese curry sauce. We loved how the rice absorbs the moisture in the meat and sauce, and perfectly combines both distinctive tastes. 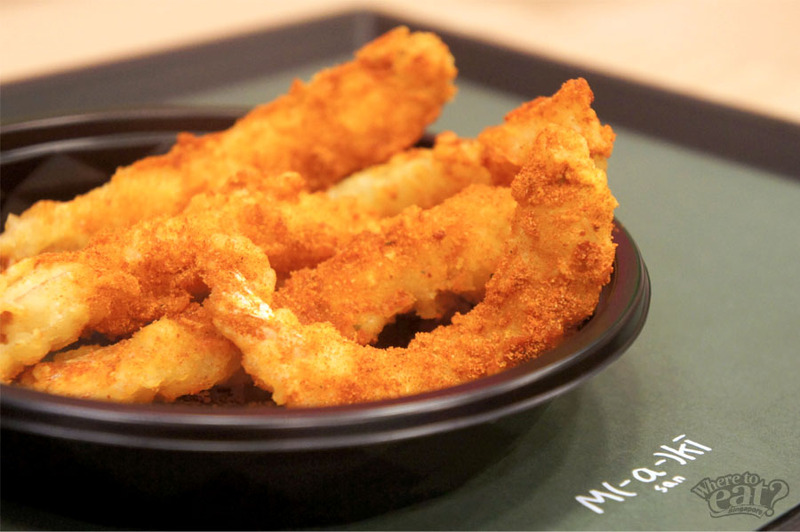 Lastly, we had the Tempura Ebi ($6.90), seasoned with special Paprika sauce and made to order. Slightly crisp on the outside and moist on the inside, the tempura prawn sent off tiny hints of spices that were relishable. 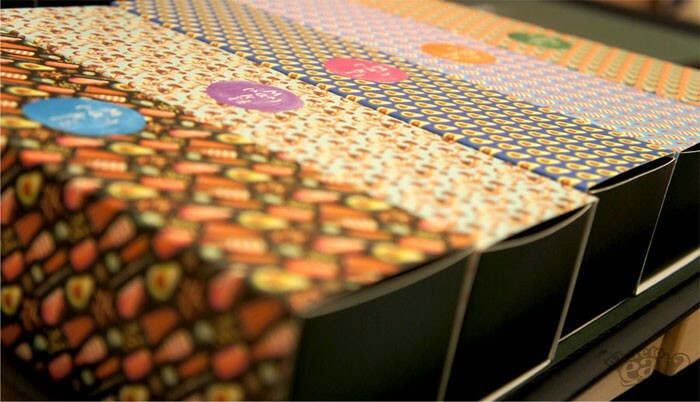 Started by Joseph San and Omar San who held previous posts in the ad industry as an Art Director and a Copywriter respectively, it is no wonder Maki-San has such powerful branding and aesthetically attractive designs. The whole concept of fresh made-to-order maki roll works, shop ejects life and exuberance, and friendly staffs are conscientious in their crafts – really, what more is there to ask for in a maki?